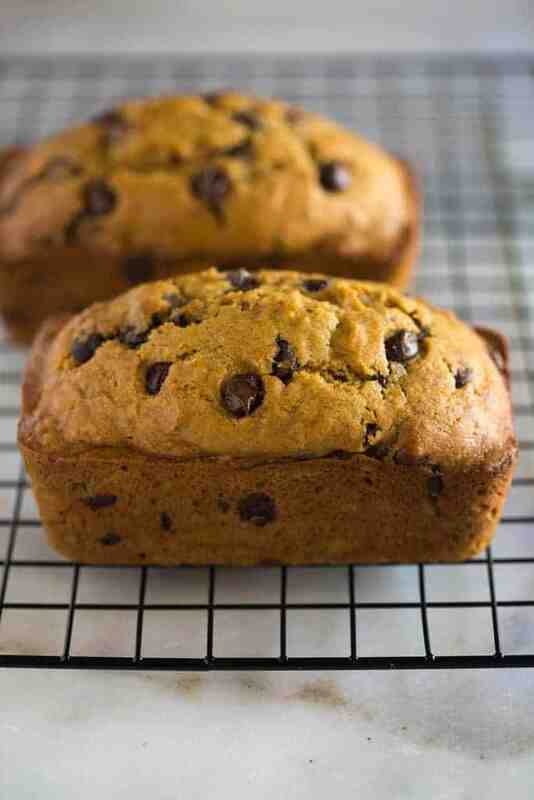 The BEST Pumpkin Bread that is easy to make, moist, and loaded with chocolate chips. This pumpkin bread recipe makes two loaves or several mini loafs. Your family will love it! 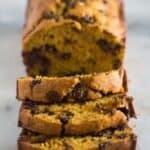 My mom made this pumpkin chocolate chip bread all the time growing up, and it’s my absolute favorite recipe! It makes two loaves, or one regular loaf and two mini loaves, so you can share with friends or neighbors. mini loaves to your friends! Also, if you want to have just pumpkin bread, feel free to leave out the chocolate chips! Cream together sugar and butter in a large bowl until smooth and creamy. Add eggs, vanilla and pumpkin puree and mix until combined. In a separate bowl mix together the dry ingredients: flour, baking powder, baking soda, salt, cinnamon, cloves, and nutmeg. Alternately add the flour mixture, then the milk. Lastly, fold in the chocolate chips. Pour batter into greased and floured bread pans and bake for 45-55 minutes or until a toothpick inserted into the center of the loaf comes out clean. Cool for a few minutes in the pan and then invert the bread onto wire racks. 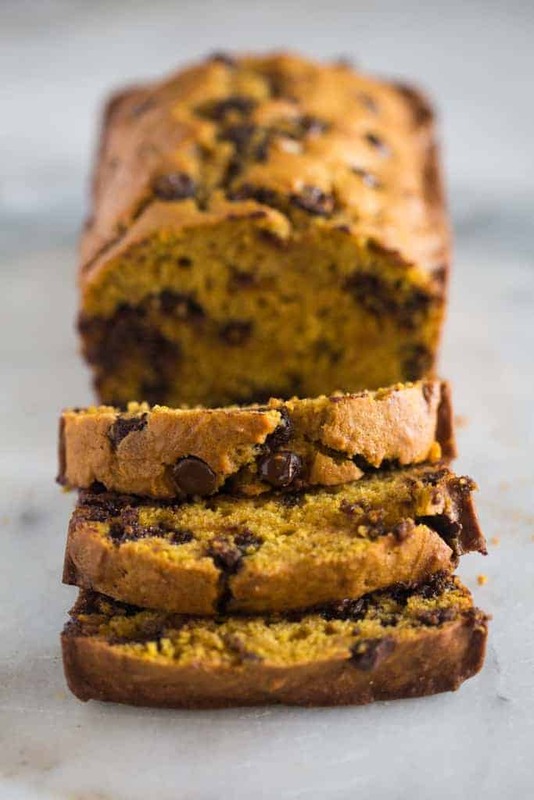 The BEST Pumpkin Bread that is easy to make, moist, and loaded with chocolate chips. This pumpkin bread recipe makes two regular loaves or several mini loafs. Your family will love it! Grease and flour two 9x5 in loaf pans. (I also like to line the bottom of the pans with wax or parchment paper.) Preheat oven to 350 degrees F.
Add the sugar and butter to a mixing bowl and beat them with an electric mixer until well combined. Add eggs, pumpkin and vanilla and mix to combine. In a separate bowl mix together flour, baking powder, baking soda, salt, cinnamon, cloves, and nutmeg. 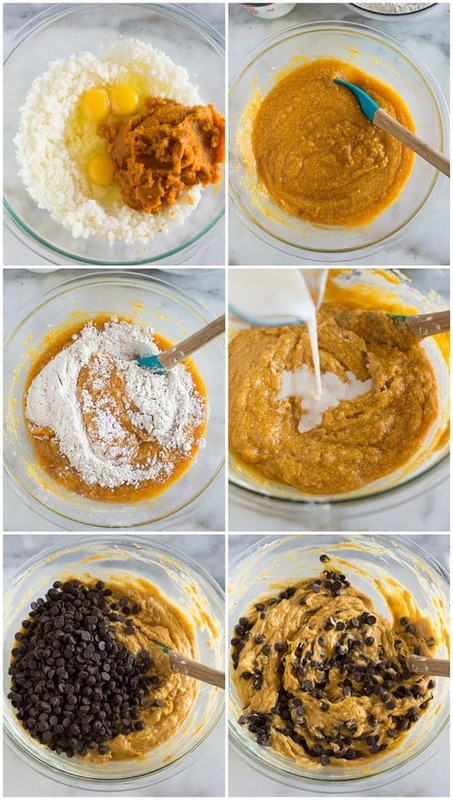 Alternately add flour mixture, then milk to pumpkin mixture, starting and ending with flour. Fold in chocolate chips at the end. Pour the batter into prepared pans. Bake at 350 degrees F for 45-55 minutes or until a toothpick inserted comes out clean. Cool for a few minutes in the pan before inverting onto a wire rack to cool. *For mini loaves, check them around 35 min of baking, then every 5 min. after that (if they need it) until they are done. Recipes makes two 9x5 inch loaves, OR four mini loaves, OR one regular loaf and two mini loaves. 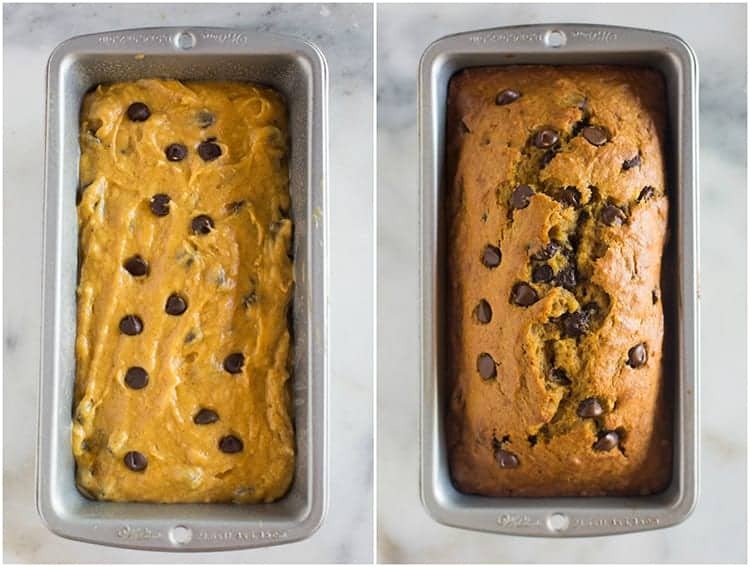 Want to make healthy pumpkin bread? See my healthier ingredient swap suggestions, above in the post. *I originally shared this recipe in October 2013. Updated August 2018. This is the first time I’ve ever made a pumpkin bread recipe that included milk! I was out of chocolate chips this time, but WOW! This bread is so moist!! I also learned some time back that I do prefer a recipe that contains both baking soda and baking powder rather than just soda, which in my opinion, has a better rise. This is a keeper! Thanks. Love your name – my grandmother was named Vera! I baked your pumpkin bread recipe today. I added 1 cup of chopped walnuts and 1/2 cup of chocolate chips. Instead of the 2 cups sugar, 1 added 1 1/2 cup. It came very moist, I like the nutty flavor and taste just right for me as how sweet it is. Thank you for the great recipe. Couldn’t agree more! Glad to have you! SO moist and yummy!! I used 1 cup white sugar, and 3/4 cup light brown sugar. The vanilla flavor really comes through – this tastes more like a cake than a traditional quick bread! Do you have to put Milk in it ? Or do you substitute something else for it? My family loves this bread – with or without chocolate chips! I make it at least twice per month.